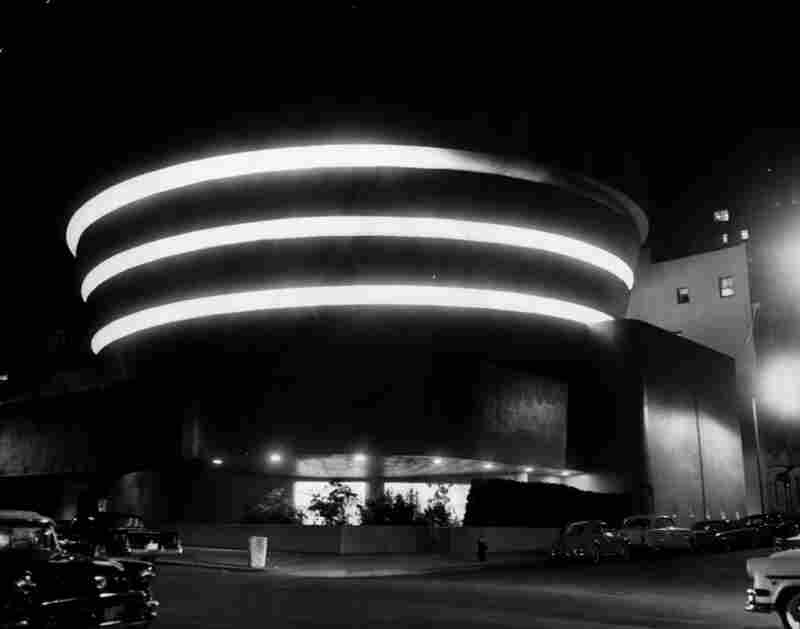 The Guggenheim At 50: A Legacy Spirals On Fifth A half-century ago, an eye-popping object landed on Fifth Avenue in New York City. It looked like it had dropped from outer space, and was treated as such. It was the Guggenheim Museum, designed by Frank Lloyd Wright, and today, tourists come from around the world to marvel at it. A contemporary view of the interior walkways at the Guggenheim Museum. 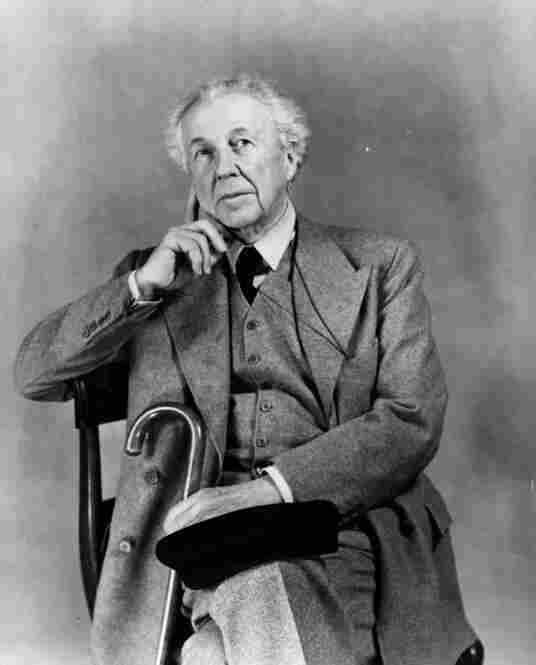 The New York landmark marks its 50th anniversary with an exhibition titled "Frank Lloyd Wright: From Within Outward." Fifty years ago, an object landed on Fifth Avenue in New York City. It looked like it had dropped from outer space, and was treated as such. Writer Norman Mailer said it "shattered the mood of the neighborhood" -- "wantonly" and "barbarically." Prominent avant-garde artists signed a petition against it, even though it was meant to hold contemporary art. When it opened, the Solomon R. Guggenheim Museum broke a lot of centuries-old architecture rules. Its design not only shattered the squared-off line of the apartment buildings it was set against, but it also crushed the notion that buildings should have a ground floor, a first floor and so on. 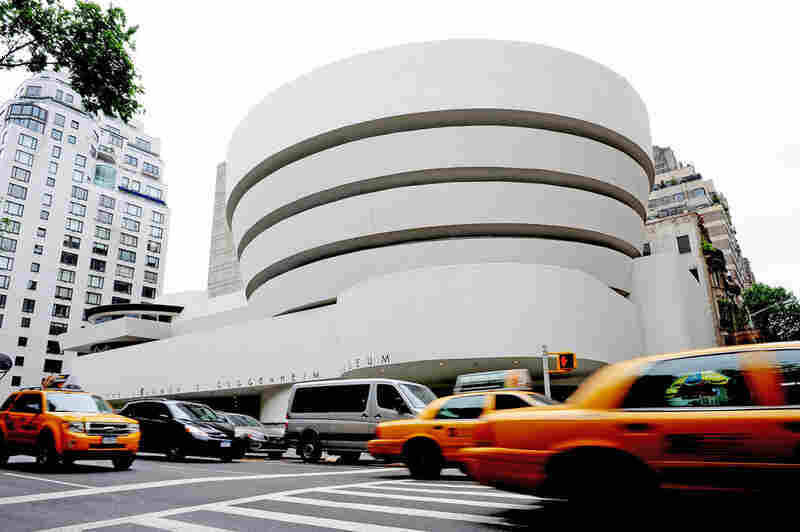 Designed by Frank Lloyd Wright, the Guggenheim earned many a dubious description upon its opening. Critics called it "inverted oatmeal dish," or a "hot cross bun." And in the face of such hostility, Wright defended his work. "Somebody said the museum out here on Fifth Avenue looked like a washing machine," Wright said. "Well, I've heard a lot of that type of reaction, and I've always discounted it as worthless, and I think it is." Today, tourists come from around the world to see the museum. Fifty years ago, the Solomon R. Guggenheim Museum, designed by American architect Frank Lloyd Wright, opened in New York City. The building broke conventional architecture rules that had existed for centuries, causing contemporary artists to sign a petition against it. Controversy over Wright's creation — including criticisms that it "looked like a washing machine" and "an inverted oatmeal dish" — followed the architect, who died shortly before its opening, to his grave. 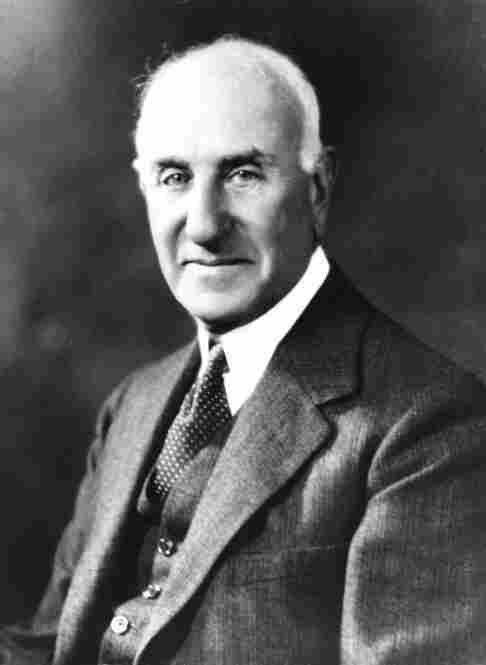 Art collector Solomon R. Guggenheim, shown here in May 1944, commissioned Wright to design and build the museum in 1943. 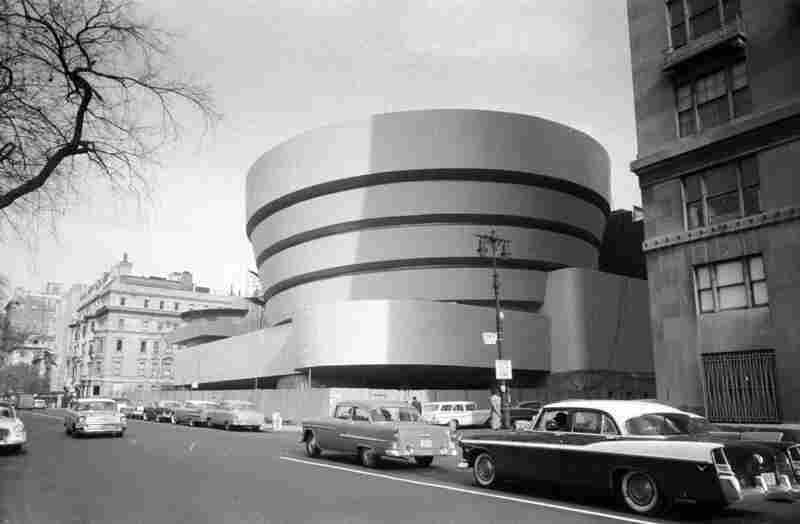 Guggenheim never saw the building's completion; he died in 1949, leaving $8 million to the foundation that administered the opening. 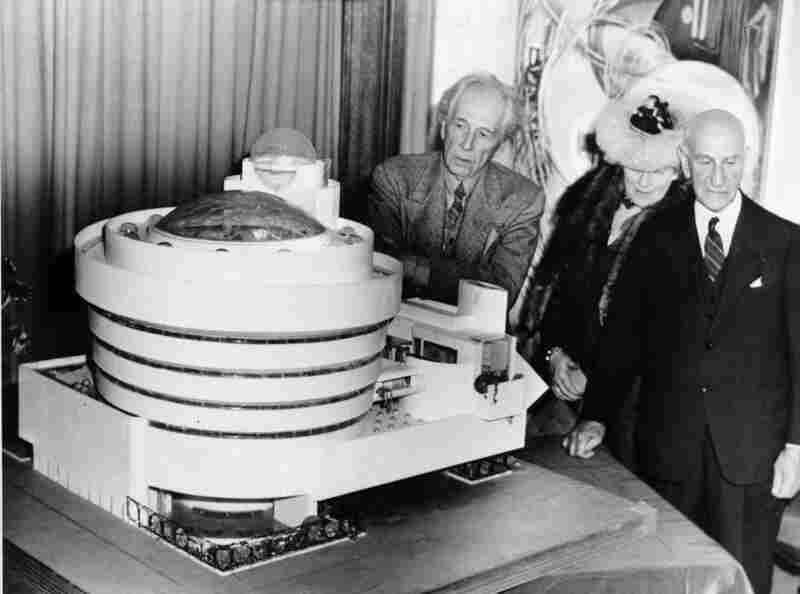 Wright (left) looks over his spiral-shaped model of the Guggenheim with its namesake patron and the Baroness Hilla Rebay, an artist and director of the proposed museum, in New York City on Sept. 20, 1945. 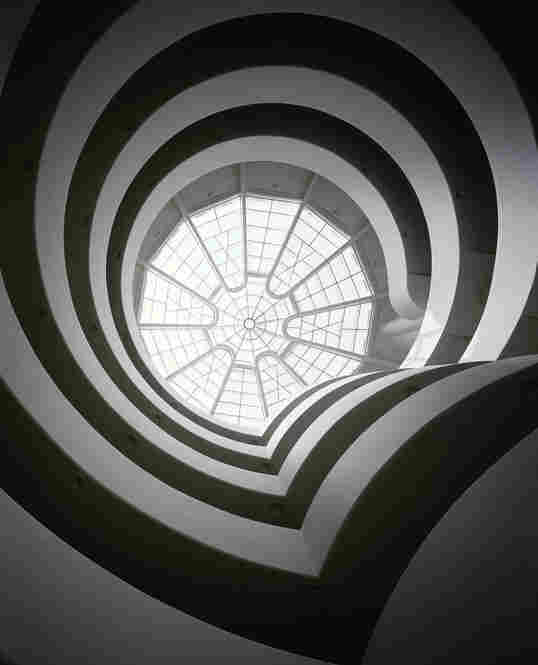 Wright developed the concept of "organic architecture" — the notion that a building should develop out of its surroundings — which he used in designing the Guggenheim. 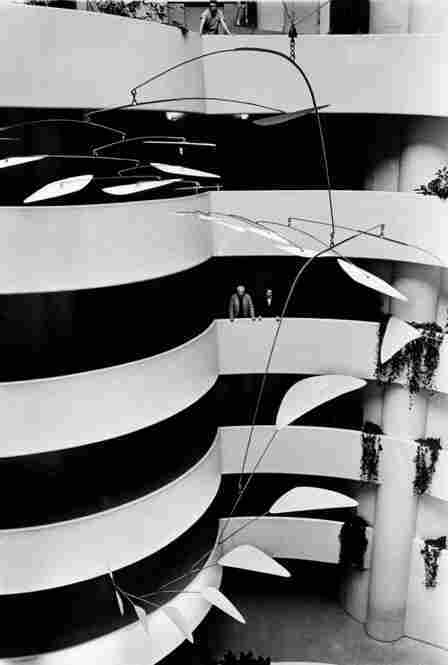 Artist Alexander Calder (left) and Guggenheim Museum Director Thomas Messer study the 35-foot mobile "Ghost" in the main rotunda of the museum on Nov. 3, 1964, in New York. 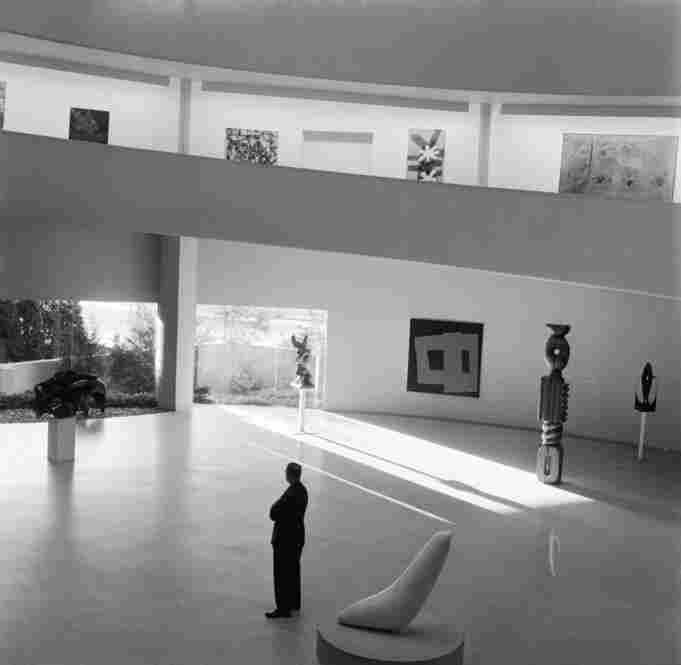 The interior of the Guggenheim in 1955. The museum's concrete rings allow light into the building to display exhibits to their full potential. Natural light pours in through the windows and floods the interior of the Guggenheim in 1955. Artworks are displayed on the ramp concourse, which spirals upward to the building's apex. In 2009, the museum marked its 50th anniversary with the exhibition "Frank Lloyd Wright: From Within Outward," seen here from an interior walkway. An exterior view along Fifth Avenue on May 14, 2009. The museum has housed more than 3,000 modern paintings and sculptures in its 50 years. "I think the legacy of this building is in the message that architecture does not have to lie down and play dead in front of art," says Paul Goldberger, architecture critic for The New Yorker. "That there are other ways to show art than in a neutral space. That an architect can do something that's powerful in itself and that enhances the experience of looking at art." Inside the building, a ramp spirals upward, with the museum's collection displayed along the ramp as it coils toward the museum's glass ceiling. Some say if you stand on a slight slant and can't get close enough to a piece -- or far enough away -- it can be hard to fully appreciate some of the art. Martin Pedersen, editor of Metropolis magazine, admires the building but isn't so sure about the ramping concourse. "I've never once felt comfortable underfoot, viewing art, and I've been to many, many, many exhibitions," Pedersen says. "You feel always slightly off-kilter watching art there." But Frank Lloyd Wright scholar and Harvard professor Neil Levine says that was the intent, and the resulting space can help many types of art put you into "a daydream." "In other words, it's a space that's -- I don't want to say 'surreal,' but it's outside the boundaries of reality," Levine says. "It's a space of walking through and being relieved from the normal conditions of the world, because there's no horizon line, there is no straight path, there's no verticals, there's no horizontals. So everything is different from 'the real world.' "
The building isn't the only thing that was different. So were the paintings that Solomon Guggenheim collected: radical new abstract art for a new world, a world suffering from the effects of World War II. It was specifically to showcase that collection that Guggenheim and his curator asked Wright for what they called a "Temple of Spirit." Wright's vision wasn't fully realized; he wanted visitors to take a glass-tube elevator to the top of the building, relax under a glass sphere with a telescope and garden, and then -- primed for the experience -- stroll down the ramps to the art. "Which would be a very gentle way of perceiving the works of art in the building," says Neil Levine, before swiping a line from Wright himself: "Let the elevator do the lifting so the visitor could do the drifting." 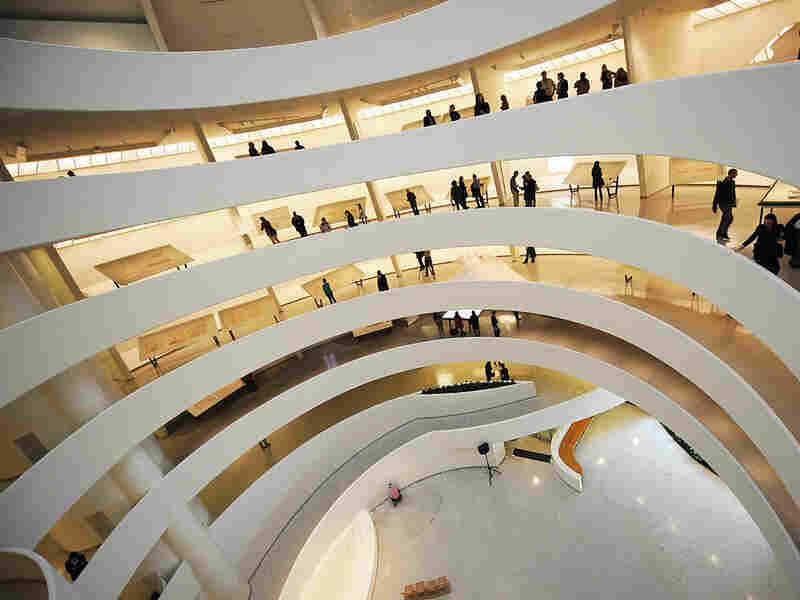 Bruce Brooks Pfeiffer, director of the Frank Lloyd Wright Archives, says now that curators understand the unique nature of the Guggenheim space, the exhibitions work better. "What's amazing, when you're in the building, when you're on the ramp, you can see where you are, naturally, but you can see where you've been and you can see where you're going," Pfeiffer says. "It's as though you are in control of the time-space continuum." 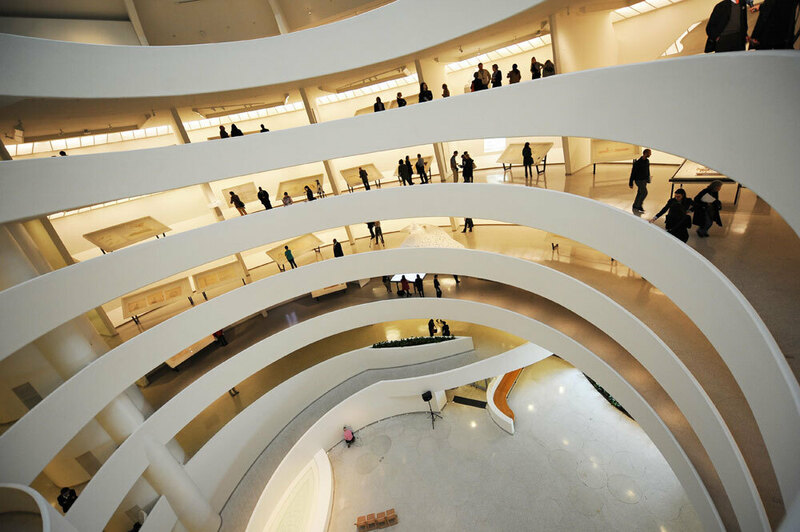 Wright also designed the Guggenheim as a place to see other people and to be seen. It helped usher in the era of museum branding and spawned every freestyled sculptural museum of the past half-century. The most famous of them might be another Guggenheim: the one in Bilbao, Spain, by architect Frank Gehry. Gehry's next project -- the Guggenheim for Abu Dhabi -- is moving forward, but in the current economic climate, the architect says, it's getting harder to build works with "spirit, passion and feeling." "I think that throwing architecture under the bus is being touted by the people who can't do the other," Gehry says. "And this is a great excuse to trash those who can, and say we're through with those guys, and now we're going back to straight simple, minimalist, idiocy again. Cold simple sterility. It's got to be green, though! As long as it's green, you're OK."
That's today's way to save the world. 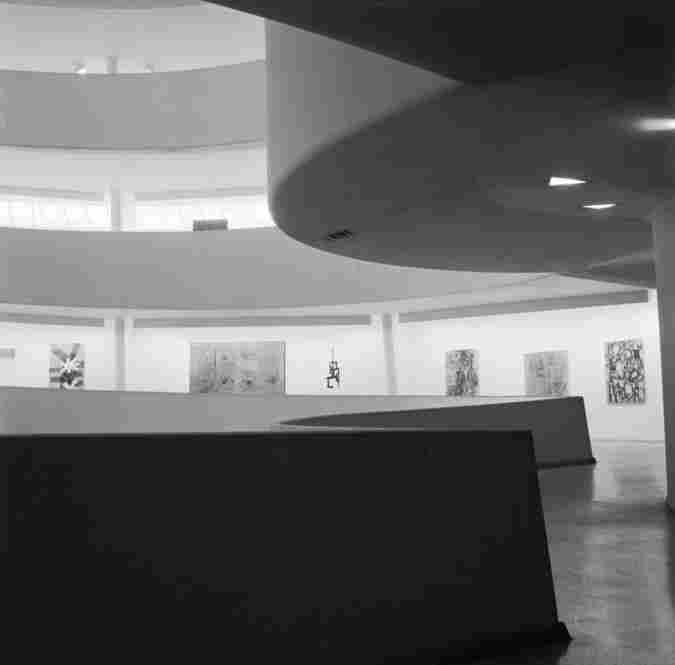 Fifty years ago, Solomon Guggenheim and his curator thought experiencing their new kind of art -- in Wright's new kind of space -- was "the only solid way to peace." Did we get there, or, as in the Guggenheim, are we going around in circles? Edward Lifson writes about architecture at www.EdwardLifson.com.